Ready, set, Sony's 3D firmware update for the PlayStation 3 will go live in Japan next week Thursday, June 10, says Sony, with U.S. and other markets expected to follow shortly. From technology tease to tangibly dated download, the eagerly anticipated (and occasionally derided) eyeball-fakeout technology arrives overseas in just nine days. 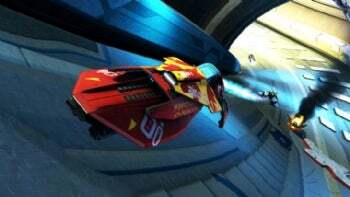 According to Japanese news-watcher Andriasang, Sony will kick things off in the Land of the Rising Sun by adding 3D support to three downloadable games, including racer Wipeout HD, asteroid zapper Star Strike HD, and human-chucking catharsis engine Mr. Pain (the latter two are Japan-only titles at this time). A fourth--international muscle-racer Motorstorm 2--will be available as an exclusive demo with the purchase of a 3D Sony Bravia TV. We've heard nothing firm yet about U.S. release plans or launch titles, but with E3 just a few weeks away, those dates should be imminent. Sony also said it'll add Blu-ray 3D support to the PS3 by the end of the year. Roger Ebert may be a naif about games as art, but I'm squarely in his camp on 3D. It's a distraction, "a waste of a perfectly good dimension," a cynical sales ploy to drive up TV prices and--we'll see, but probably--add surcharges to 3D versions of existing games. Put another way, my list of things I'm excited to see at E3 2010 next month, ranked: The Last Guardian, Zelda Wii, Civilization V, nearly everything else, motion-control devices, watching paint dry, PlayStation 3D.